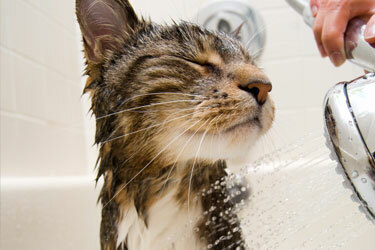 A: We recommend setting up a maintenance grooming schedule of at least every 4-6 weeks. With regular grooming, your pet’s coat will stay in good shape, shedding is reduced, fleas and ticks can be better controlled and your pet will just look and feel better. Q: How long does the grooming take? A: Most grooms are finished in 1 to 1.5 hours. Occasionally, more or less depending on the pet. Q: Do I have to be home when you groom my pet? A: Yes, you must be present the first time we come to your home or office. After the initial visit we will work out an arrangement with you to groom your pet when you are not home if that is more convenient for you. Q: Is there anything that I need to do at my location for you to groom my pet? A:Please allow your pet to go out for a potty break before we arrive. If possible, please do not feed your pet within an hour before we arrive. Inspect your location and identify the best parking and entering and exiting route so that our trailer does not interfere with buildings, vehicles etc. If you live in a gated community or other arrangement where security must be notified, please do so. Q: Should I tip the groomer? A: Like any other service profession, tips are always welcome. The grooming process is a long and sometimes difficult one. Groomers often have to contend with pets that bite and /or constantly move on the table and are uncooperative during the entire grooming process. Our groomers spend a great deal of time being gentle and loving with your pet and take pride in their work, so tips are always greatly appreciated but not expected. Q: My dog has a lot of mats. Is it really necessary to shave her almost bald? A: It depends on the severity of the matting. Your dog’s health and well being is our first concern. Minor mats can sometimes be worked out by hand or with other tools. Sometimes shaving down is the only humane solution. Severe mats can cause skin irritations and hide other conditions such as hot spots, dermatitis, seborrhea, parasites, cuts, scabs, sores and redness. We can’t be responsible for the condition of your pet’s skin under all that hair, but we will do our best to warn you ahead of time so you are aware of the danger. Because your dog is severely tangled or matted, they are at greater risk of injury, stress and trauma. All precautions will be taken during the grooming of your dog. However, problems can occasionally arise, during or after the grooming, such as nicks, clipper irritation and mental or physical stress. Your groomer will decide whether it is possible to de-matt your dog gently and humanely or if a “shave down” is necessary. Often after shaving, your dog’s skin can look fine, but she will spend the next few days scratching like crazy. Unfortunately, this is normal. Severe matting decreases the circulation of blood to your dog’s skin. You know how it feels when your foot falls asleep; imagine that feeling all over your whole body and you will understand why your pet is scratching incessantly. Of course, we want your dog to look beautiful, but it’s more important that they’re healthy. We will discuss your choices, how best to address them and most important of all, how to avoid the same situation in the future. Q: My dog is kind of cranky and not very well behaved. Will you be able to groom him? A: There isn’t much we haven’t seen or dealt with. We see all dogs as potential friends. Most dogs with behavioral issues are just scared and with care and compassion, a new friendship can blossom. If your dog’s issues are especially time consuming, there might be a small "cranky friend" handling fee. Q: Why do my dog’s nails sometimes bleed after having been groomed? A: Sometimes a dog’s nails are very long and we try to cut them as close as possible to the quick (the vein located inside the dog’s nails). If the nails have been neglected, the quick will grow to the end, so when the nails are cut, the quick may also be cut. This is not serious and we have powder that stops the bleeding. However, when the dog walks on pavement, the nail may open and bleed again. You can use a dry bar of soap and scrape it against the nail. You can also use flour or baking powder to stop the bleeding. If your dog’s nails are long, they should be cut every few weeks so the quick will recede and prevent bleeding in the future. Q: What if I’m unhappy with the groom? 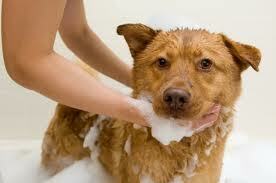 A: If, for any reason, you are dissatisfied with your pet’s groom, by all means tell your groomer before they leave. If you pay for a service, you should be getting what you expected. There may be a reason your pet’s haircut is choppy, or a toenail is bleeding. Perhaps your pet was wiggly, heavily matted or the nails had been neglected. Our groomers want to work with you to ensure satisfaction, and they can’t fix what they don’t know about. Pet grooming is not an exact science. All dogs are not created equal, and most pets come with their own quirks and idiosyncrasies. If you have questions about your pet’s grooming session please ask the groomer. If you still have concerns, please contact the office immediately and allow management the opportunity to address the situation and make it right. Your satisfaction is our goal!